Islamic Educational Welfare Association Pomote family welfare programme. provides this website and the materials located at and under the domain name www.iewango.org and such other domains as Islamic Educational Welfare Association operates or may in the future operate (collectively, this "Site" ) and any other Islamic Educational Welfare Association services offered on this Site as described in Section 1.2 below (collectively, the "Services" ) to you, the user, subject to compliance with these terms and conditions and our Copyright Notice and Claims Regarding Copyright Infringement Policy of the relating to this Site and the Services (collectively, this "Agreement" ). By accessing or using the Site or the Services, you accept and agree to be legally bound by this Agreement, as it may be amended or supplemented from time to time, and agree to all operating rules, terms, conditions, policies, and procedures that may be published on this Site or in connection with the Services. All such rules, terms, conditions, policies, and procedures are incorporated into this Agreement by this reference. We may change, add or remove portions of this Agreement at any time, and if we do so, we will post such changes on the Site and the changes will become immediately effective, and your continued use of the Site will indicate your acceptance of this Agreement as it is then in effect. Accordingly, you should visit this Site from time to time to review the then-current and effective terms and conditions because they are legally binding on you. 1.1 GENERAL LICENSE. If you have not paid for the Services, Islamic Educational Welfare Association hereby grants to you a revocable, non-exclusive, non-transferable, non-sublicensable limited right and license to access and use only those portions of the Site and the Services accessible to trial users approved by Islamic Educational Welfare Association without a password or logon for your own personal research use, subject to this Agreement. In order to use the Services, you must provide and maintain adequate communications and computer equipment and obtain access to the World Wide Web directly or through devices that access web-based content. You are responsible for paying any and all service fees associated with such access. As a condition to your use of this Site and the Services you agree that you will not: (i) use this Site or the Services to infringe the intellectual property rights of others in any way or violate any other rights of any third parties; (ii) use this Site or the Services or make any attempt to penetrate, modify or manipulate this Site or the Services or any of Islamic Educational Welfare Association’s hardware or software in order to: invade the privacy of, obtain the identity of, or obtain any personal information about (including but not limited to IP addresses of) any Islamic Educational Welfare Association account holder or user, or modify, erase or damage any information contained on the computer of any user connected to the Services; (iii) reverse engineer, disassemble, decompile, aggregate, disaggregate or obtain unauthorized access to or use of any elements or portion of the Services; or (iv) use this Site or the Services in any other inappropriate, objectionable, harmful or illegal manner. If you are accessing a Islamic Educational Welfare Association Paid service pursuant to an Access Agreement executed by Mahatama jyotiba phule education samiti and either you or the library or other institution providing you access, then, subject to that Access Agreement, Islamic Educational Welfare Association hereby grants to you, a revocable, non-exclusive, non-transferable, non-sublicensable limited right and license to access and use those portions of the Site made available to you pursuant to that Access Agreement. Islamic Educational Welfare Association may change, suspend or discontinue any aspect of the Site and/or the Services at any time, including the availability of any Service feature, database, or content. Islamic Educational Welfare Association may also impose limits on certain features and services or restrict your access to parts or all of the Service without notice or liability. Certain areas of this Site may require registration and purchase of a license to access certain content, and will be subject to additional terms and conditions. Products and services referenced herein may not be available in all jurisdictions. The information contained on this Site was believed to be accurate at the time it was posted and Islamic Educational Welfare Association periodically updates the information on this Site; however, Islamic Educational Welfare Association provides all information on this Site on an "as is" and "as available" basis as set forth in Section 7 below and Islamic Educational Welfare Association shall not be responsible or liable in any way for the timeliness, accuracy, content or applicability of the information on this Site. Links on this Site may provide access to other Internet sites that are not maintained or controlled by Islamic Educational Welfare Association. Such external Internet sites contain information created, published, maintained or otherwise posted by organizations and entities independent of Islamic Educational Welfare Association. Islamic Educational Welfare Association is not responsible for the content of those sites. Links on this Site may also provide access to other entities affiliated with Islamic Educational Welfare Association. This Agreement applies only to the Services offered at the Site. Your use of any website other than the Site will be subject to the terms and conditions posted on that website. 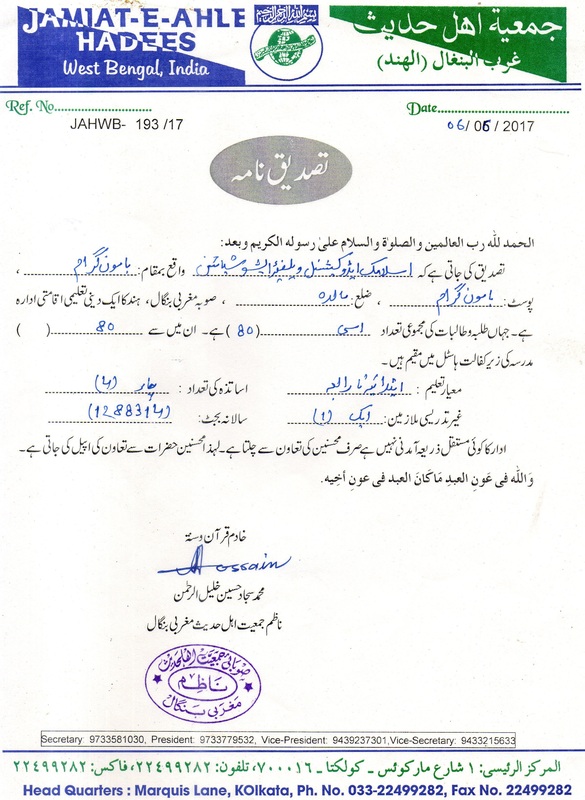 Islamic Educational Welfare Association takes no responsibility and assumes no liability for any content posted by any third party or on any other website, nor does Islamic Educational Welfare Association approve, endorse, verify or certify information available at any external site or linked addresses. Islamic Educational Welfare Association takes no responsibility and assumes no liability for the privacy practices of such third parties. All content included on this Site including, without limitation, text, graphics, logos, button icons, images, audio clips, digital downloads, data compilations, and software, the compilation of all content on this Site, and all software used on this Site are the property of Islamic Educational Welfare Association or its content suppliers and protected by Indian and international copyright laws. The DAI name and logo, and all other trademarks, service marks, and trade names appearing on this Site (collectively, "Marks" ) are owned by Islamic Educational Welfare Association or its licensors. Nothing in this Agreement or on the Site grants you any right or license to make any use of any materials or Marks on this Site other than as described in the following paragraph. We post various copyright notices and copyright management information, terms of service, and other legal notices as well as various credits on pages of this Site and the Services, which you may not remove even from your permitted copy. Certain portions of this Site are protected by various technological measures that control access to and otherwise protect the rights of Islamic Educational Welfare Association and its licensors as copyright owners. Any circumvention of such measures is strictly prohibited and subject to criminal prosecution as well as civil sanctions. Notwithstanding any copyright notices to the contrary, no copyright is claimed in the text of certain public domain documents or images available through the Services, but the selection, compilation, presentation and arrangement of such public domain materials are copyrighted by Islamic Educational Welfare Association and subject to the terms set forth herein. Certain content and materials (collectively, “Compilation”) available through the Services are largely factual in nature and are available for copying and reuse. However, any reproduction, distribution, display or modification of all or any substantial portion of this Compilation or any subgroup thereof requires the express prior written permission of the Islamic Educational Welfare Association. You are only authorized to visit, view and retain a single copy of the pages of this Site solely for your own individual, noncommercial use. You may incorporate insubstantial portions of materials in an amount not to exceed ten percent (10%) of the records retrieved from the Site into your materials, but you may not duplicate, download, publish, modify or otherwise distribute any material on this Site for any purpose other than your own individual, research use unless you have received prior specific authorization in writing from the Islamic Educational Welfare Association. If you are accessing the Services described in Section 1.2 above, your use shall also be governed by the terms of your Access Agreement. You are responsible for all of your activities and those of others you permit to access the Site and the Services through your facilities. You may not violate or attempt to violate the security of the Services. Accordingly, you shall not (a) circumvent or attempt to circumvent any security measures designed to control access to the Site or Services or in any way obtain or attempt to obtain unauthorized access to or use of any elements or portion of the Services; (b) access data or materials not intended for you; (c) log into a server or account which you are not authorized to access; (d) attempt to probe, scan or test the vulnerability of a system or network or to breach security or authentication measures without proper authorization; (e) use this Site or the Services to infringe the intellectual property rights of others in any way – be advised that it is our policy to terminate the accounts of repeat infringers of copyright; (f) use this Site or the Services or make any attempt to penetrate, modify or manipulate this Site or the Services or any of Islamic Educational Welfare Association s hardware or software in order to: invade the privacy of, obtain the identity of, or obtain any personal information about any third party; (g) attempt to interfere with service to any user, host or network, including without limitation, by submitting any harmful code, trojan horse, worm or virus to the Services, any denial of service attack, overloading, mailbombing or attempted crashing of the Services or the software or hardware used in providing the Services; (h) spoof or otherwise impersonate any individual or entity, or forge, delete or alter any part of TCP/IP packet header information in any e-mail or other posting; (i) create "deep links" into pages other than the front page of the Site; or (j) assist or permit any persons in engaging in any of the activities described above. In order to access certain Services offered through the Site, you may be required to pay fees and/or accept additional terms and conditions and in such event you may be provided with a number, code or other sequence that provides access to certain restricted Services (the "ID" ) and to your account (the "Password" ). You are the sole and exclusive owner of the Password and ID combination. Maintaining the confidentiality and security of your Password and ID is solely your responsibility. You are fully responsible for the use and protection of the Password and ID and for all transactions undertaken by means of any account opened, held, accessed or used via your Password and ID. You shall notify us immediately and confirm in writing any unauthorized use of accounts or any breach of security, including, without limitation any loss, theft or unauthorized use of your Password(s), IDs and/or account number(s). If we have reasonable grounds to suspect that the security of your Password has been compromised, we have the right to suspend or terminate your account, refuse any and all current or future use of the Services, and pursue any appropriate legal remedies. We shall not be responsible for any losses incurred in connection with any misuse of any Password or ID. 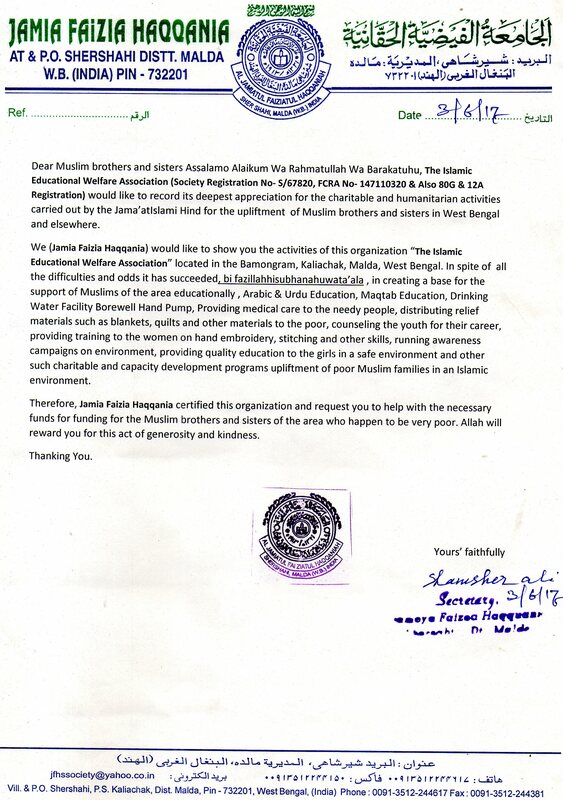 You shall notify the Islamic Educational Welfare Association by email at bgvs.amroha@gmail.com. of any known or suspected unauthorized use of the Services, of any known or suspected breach of security, including, without limitation, loss, theft, or unauthorized use of your Password or ID. Subject to the terms below, Islamic Educational Welfare Association represents that it has the right to license the rights granted under this Agreement. 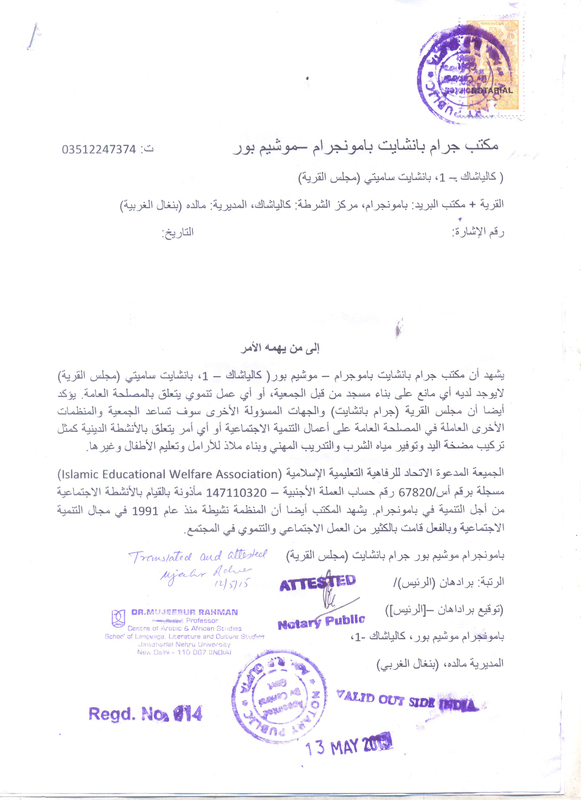 Islamic Educational Welfare Association MAKES NO REPRESENTATION OR WARRANTY, AND EXPRESSLY DISCLAIMS ANY RESPONSIBILITY FOR LIABILITY WITH RESPECT TO YOUR USE OF THE SITE OR THE SERVICES OR THE RESULTS OBTAINED FROM YOUR USE OF THE SITE OR THE SERVICES, INCLUDING, BUT NOT LIMITED TO, LIABILITY ASSOCIATED WITH ERRORS OR OMISSIONS, LIBEL, INFRINGEMENT OR VIOLATION OF RIGHTS OF PUBLICITY, PRIVACY, INTELLECTUAL PROPERTY RIGHTS, OR MORAL RIGHTS, OR THE DISCLOSURE OF CONFIDENTIAL INFORMATION. MOREOVER, EXCEPT FOR THE EXPRESS WARRANTIES STATED HEREIN, THE SITE AND THE SERVICES ARE PROVIDED ON AN "AS IS" AND “AS AVAILABLE” BASIS, AND Islamic Educational Welfare AssociationDISCLAIMS ANY AND ALL OTHER WARRANTIES, CONDITIONS, COVENANTS, OR REPRESENTATIONS (EXPRESS, IMPLIED, ORAL OR WRITTEN), RELATING TO THE SITE OR THE SERVICES OR TO ANY PARTS THEREOF, INCLUDING, WITHOUT LIMITATION, ANY AND ALL IMPLIED WARRANTIES OF QUALITY, PERFORMANCE, MERCHANTABILITY OR FITNESS FOR A PARTICULAR PURPOSE. DAI ALSO MAKES NO WARRANTIES RESPECTING AND SHALL HAVE NO RESPONSIBILITY FOR ANY HARM THAT MAY BE CAUSED BY THE TRANSMISSION OF A COMPUTER VIRUS, WORM, TIME BOMB, LOGIC BOMB OR OTHER SUCH COMPUTER PROGRAM OR OTHERWISE. DAI FURTHER EXPRESSLY DISCLAIMS ANY WARRANTY OR REPRESENTATION TO ANY THIRD PARTY. You agree to indemnify and hold Islamic Educational Welfare Association harmless, and, at Islamic Educational Welfare Association request, to defend Islamic Educational Welfare Association from and against any claim, demand, cause of action, debt, damage, loss or liability, including reasonable attorneys’ fees, to the extent that such action is based upon, arises out of, or relates to: (i) your use of (or inability to use) this Site and/or the Services; (ii) your violation of the terms and conditions of this Agreement; (iii) the infringement by you, or any other person using your Password and/or account, of any right of any person or entity; or (iv) any other activities of yours accomplished using this Site and/or the Services. You agree to cooperate as fully as reasonably required in the defense of any such claim. Islamic Educational Welfare Association reserves the right, at its own expense, to assume the exclusive defense and control of any matter subject to indemnification by you. This indemnity shall be in addition to and not limited by any other indemnity. This Agreement governs your use of the Site and access to the Services. To the extent that any provision of this Agreement, or any supplemental agreement offered as any part of any registration for additional Services on this Site (including any Access Agreement), conflicts with any provision of any other agreement(s) between you and Islamic Educational Welfare Association or any of its related or affiliated entities, the terms of this Agreement, shall, as to the specific subject matter of this Agreement, take precedence over the conflicting term(s) of such other agreement(s). In the event this Agreement conflicts with any provision of your Access Agreement, the terms of the Access Agreement shall take precedence over the conflicting term(s) of this Agreement. 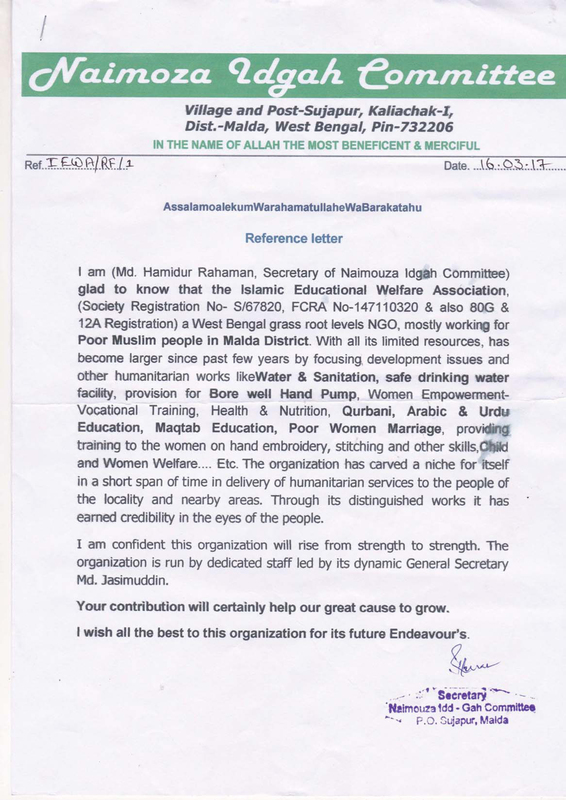 This Islamic Educational Welfare Association website is controlled by Islamic Educational Welfare Association from its offices within the State of Delhi and the substantive laws of the State of Delhi will govern any dispute arising under this Agreement, without regard to any conflict of laws provisions. Without limiting any other remedy available to us, we may suspend or terminate this Agreement and your access to the Services and/or Site under this Agreement if we have reason to believe that you have failed to comply with your obligations under this Agreement. Upon termination, cancellation or expiration of this Agreement for any reason and by either party, you agree to cease all use of the Services. Certain provisions of these terms and conditions may be superseded by expressly designated legal notices or terms located on particular pages at this Site or in conjunction with the Services. No delay or failure to enforce any provision of this Agreement will constitute a waiver of such provision by Islamic Educational Welfare Association or act as estoppel against later enforcement. Subject to the terms of the section captioned ORDER OF PRECEDENCE, this Agreement constitutes the entire agreement between you and Islamic Educational Welfare Association with respect to the specific subject matter addressed herein, and governs your use of the Services, superseding any prior agreements between you and Islamic Educational Welfare Association relating to such subject matter, but this Agreement may be supplemented by any other agreement you enter into with Islamic Educational Welfare Association pursuant to a registration to access certain features of the Site such as an Access Agreement You may not assign any of your rights or delegate any of your obligations under this Agreement without the prior written consent of Delhi. You may not assert any claim or cause of action arising out of or relating to your use of the Services more than one year after the date such claim or cause of action arose. 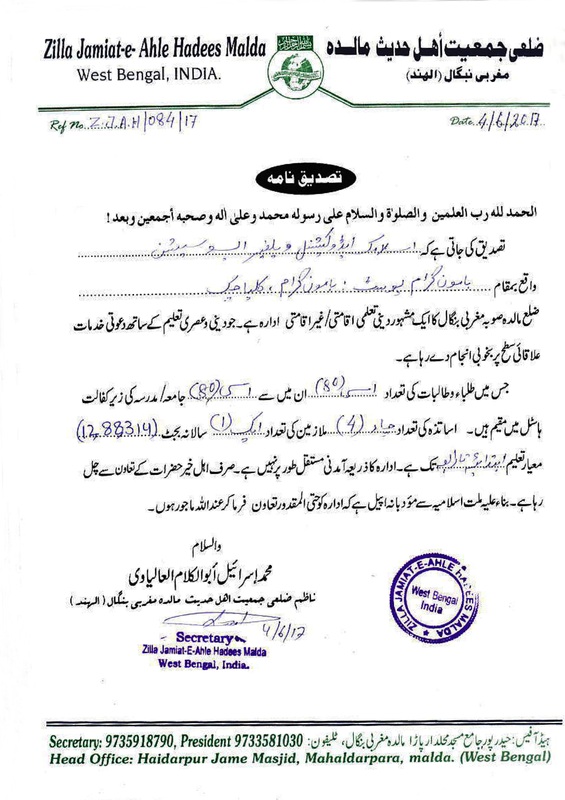 Delhi shall not be deemed to be in breach of this Agreement due to any delay or failure of performance or interruption in the availability of the Services resulting directly or indirectly from any act of nature or other cause beyond the reasonable control of Islamic Educational Welfare Association . Islamic Educational Welfare Association may terminate this Agreement for any reason at any time without any advance notice to you. Notwithstanding any such early termination, Sections 2 through 12 of this Agreement shall survive any expiration, cancellation or termination of this Agreement.